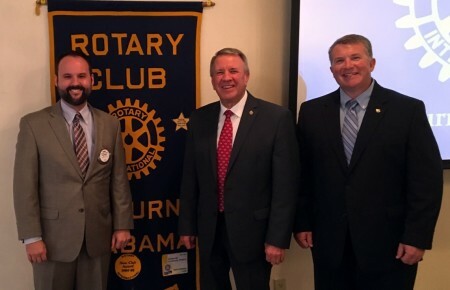 At its meeting on Wednesday, Oct. 4, the Auburn Rotary Club hosted Speaker of the Alabama House of Representatives Mac McCutcheon (center), who resides in Huntsville and represents House District 25, which includes the communities of Madison City, Huntsville, Capshaw, Monrovia and East Limestone. McCutcheon spoke about the House of Representatives’ priorities for the upcoming session, as well as the focus of his leadership. Pictured with McCutchen is Club President Chris Warren (left), and program host and Alabama District 79 State Representative Joe Lovvorn (right). The Auburn Rotary Club meets each Wednesday from noon to 1 p.m. at Saugahatchee Country Club. For more information about the Auburn Rotary Club or how to become a member, visit www.auburnrotaryclub.com.